DSM-5 stands for the Diagnostic and Statistical Manual of Mental Disorders, 5th Edition. 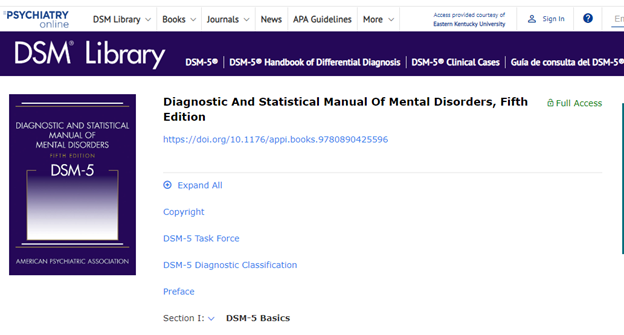 The easiest way to track the manual down is by searching “DSM-5” on our A-Z Database List page. From there, you have two options to choose between--DSM-5 and Psychiatry Online--both will allow access to the full text of the manual. Scrolling down and opening each section, the text has been broken into multiple sections (you can just see “Section I” listed at the bottom of the above image), and the links within each section are clickable. Access the DSM-5 here via Psychiatry Online!